Do you feel you absorb the moods and energies of people around you? Do you find yourself mirroring other people’s emotions or opinions back to them, often without realizing it until you are out of a situation? Do you sense that you energetically anchor your family and friends, and does that sometimes become overwhelming? These are all common experiences for many women. Our social conditioning encourages us to structure our identities around our relationships, and our role in others’ lives. But there is more at work in these experiences than simple emotional sensitivity. There are also energetic principles at work – qualities of our feminine energy bodies that impact how we experience and interact in all aspects of our lives. What do I mean by ‘energy body’? I think of our energy body as the intermediary between our physical body and our spirit. We both receive and transmit energetic ‘data’ through our energy body. Others’ emotions and thoughts, vibrations from our physical surroundings, and messages or insights from spiritual levels of being, pass through our energy body into our physical self. Our own moods, thoughts, physical and spiritual vibrations are transmitted outward, also through our energy body. 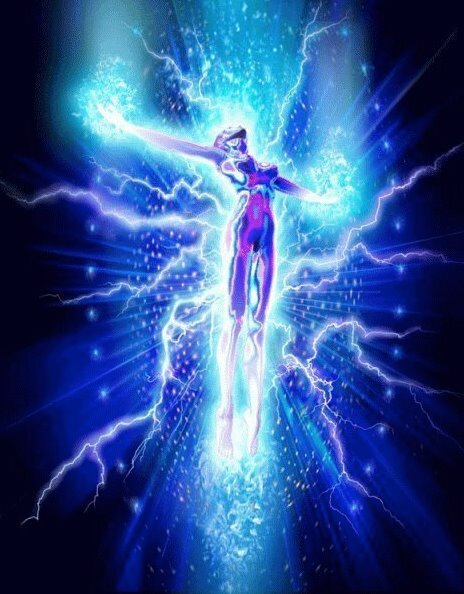 Our energy body is our energetic antenna. Just as we have a physical anatomy, so we also have an energetic, or subtle, anatomy. Many cultures around the world have developed energy body mappings, some as part of energy healing traditions, and others as part of spiritual traditions. The most common health-based mapping is the meridian system – the basis for acupuncture, and several other alternative healing modalities. The most common spiritually-derived mappings are chakra systems, used in yoga and meditation traditions as gateways to spiritual growth and experience. What is most helpful for women to understand is that our energy bodies differ from men’s – just as our physical bodies differ. In fact, many of our energy body differences mirror the physical differences; and just as the physical differences – particularly in our hormonal levels and patterns – influence every aspect of our health, so our energetic differences influence many areas of our lives. 2) Women’s energy bodies run in cycles and phases. Just as our physical bodies experience a hormonal cycle every month in our pre-menopausal years, so our energy body also flows in cycles. Our energy bodies are more centripetal, more absorbent of energy from the outside, in the days leading up to menstruation. We are more creatively oriented – expressing outwards both energetically and personally – closer to ovulation. Peri-menopause is often a time of extreme energetic swings between these two phases, as our cycle becomes less regular. Although often challenging, peri-menopause offers an opportunity for us to be reborn as wise women, with full access to both our intuitive and creative aspects. 3) Women’s energy bodies offer a unique spiritual gateway. Just as our womb is the doorway for new physical life, so the corresponding energy center – our second or sacral chakra – is a unique spiritual gateway, into Source itself. While the traditional model for spiritual enlightenment is often one based on solitary prayer and meditation, leading to a metaphysical union with Source/God, feminine spiritual traditions of all faiths have put forth an alternative, uniquely feminine path. This path is based on embodiment, and integration with all aspects of life, rooted in our connection to creation, nature, and relationship. • Sit quietly and center yourself with a few deep breaths. • Place your hands gently on your pelvic area, 4-5 inches below your navel. Take a few deep breaths into your hands, imagining the air filling your pelvic area. If you like, close your eyes and visualize a beautiful light encompassing this area of your body. • Now move your hands up to the center of your chest, right where your breastbone begins to curve. Take a few deep breaths into your chest cavity, filling it with air. Close your eyes and visualize light filling your chest. • Move your hands to your forehead, pressing one finger a little above the midpoint of your eyebrows. Breathe into this area, and visualize a radiant light filling the entire frontal lobe of your brain. • Repeat as many times as you like. Finish by re-centering yourself and gently opening your eyes. You can combine this with any other meditation or devotional practice you may have. Over time, it will help you become aware of your feminine energy centers, and your overall feminine energy body. In future columns I will talk about ways to protect your energy body, clear it, work with the intuitive data that flows into you through it, and access the spiritual, creative doorway available to you. Sign up here to subscribe to this blog and newsletter.